On behalf of the Cleft Palate Team at The Children’s Hospital at Westmead and in conjunction with our Speech Pathology colleagues at the John Hunter Children’s Hospital, The Sydney Children’s Hospital, and Middlemore Hospital in Auckland, I would like to invite you to participate in our Hospital’s eighth VPI Update Seminar, to be held on 19-20 November, 2018. The VPI Update Seminar is a very popular and exciting two-day professional development event designed specifically for Speech Pathologists. In previous years, Speech Pathologists have attended the seminar from all over Sydney and regional NSW, as well as from interstate and even overseas. The seminar is now widely regarded as the premier local event for the continuing education of Speech Pathologists in the important clinical areas of cleft palate speech and velopharyngeal insufficiency (VPI). As the title of the seminar suggests, this programme will address, in detail, the common assessment parameters associated with cleft palate speech and VPI, including hypernasality, hyponasality, nasal emission and nasal turbulence. We will also be targeting the associated articulation and phonology disorders typically seen in children affected by cleft palate and VPI. So if you have ever wondered why the Cleft Palate Clinic Team has recommended speech therapy for the child who has ‘hypernasality’ just on the / s / and / z / sounds, then by the end of the seminar you will know exactly why this disorder is actually not hypernasality at all - and more importantly, you will know how to treat this problem easily. We know that Speech Pathologists who have attended the VPI Update Seminars in the past have all thoroughly enjoyed the experience. While the low registration price, the prizes that we give away, and the opportunity to hear national and international experts are big drawcards - it is the actual speech therapy advice that keeps Speech Pathologists coming back each year. After all, this is a seminar “for Speech Pathologists”. As such, we are not aiming to turn you into experts in VPI - but we do want to give you a range of practical treatment techniques and ideas for speech therapy from a number of Speech Pathologists who work in this clinical area. And as you will see, many of these techniques are useful for other areas of speech therapy. We are delighted to announce that this year’s keynote speaker is Lynn Marty Grames. Lynn is a Speech Pathologist from the Cleft Palate and Craniofacial Institute at St. Louis Children’s Hospital in Missouri, USA. Lynn has more than 30 years’ experience in the treatment of children with cleft palate speech and VPI and is known for her practical approach to speech therapy. Lynn has also developed an internationally recognised collaborative care programme for community Speech Pathologists that engage them to participate not only in the assessment of their patients, but more importantly, in the delivery of therapy. In keeping with this therapy focus, this year’s two local invited speakers are Helen Morris and Kate Bolton from the Cleft Palate Clinic Team at The Lady Cilento Children’s Hospital in Brisbane. Helen and Kate have extensive speech therapy experience in cleft palate speech and VPI, and we are delighted that they will be joining us here in Sydney. We are also excited to have Christina Richards from the Women’s and Children’s Hospital in Adelaide who will provide valuable information about specific craniofacial conditions and their impact on speech. 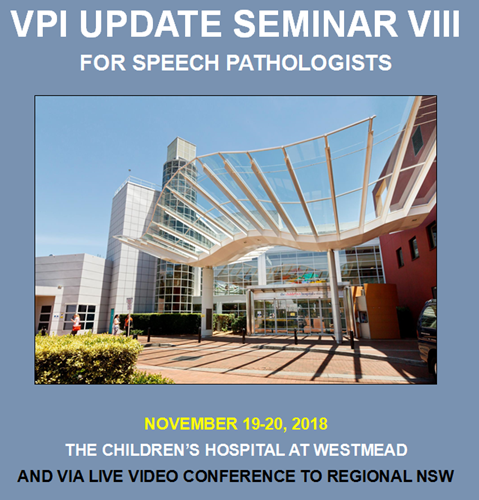 Even though the VPI Update Seminar is based at The Children’s Hospital at Westmead, it has always been a part of the seminar’s design to include content from Speech Pathologists representing different cleft palate teams with different speech therapy approaches. Maeve Morrison from Middlemore Hospital in Auckland will be attending her eighth VPI Update Seminar. The practical experience Maeve demonstrates in her presentations, particularly related to the management of children with the 22q11.2 deletion syndrome, is always well received. Locally, Jana Carr from John Hunter Children’s Hospital in Newcastle (her eighth VPI Update Seminar) and Melissa Parkin from the Sydney Children’s Hospital at Randwick (her third VPI Update Seminar) ensure that all three Cleft and Craniofacial Teams from NSW are represented in the seminar. Since 2012, the VPI Update Seminar has been made available via videoconference (or telehealth) for the benefit of rural NSW Speech Pathologists. There are a number of telehealth locations that have expressed interest in hosting a site for this year's seminar, including Dubbo, Wagga Wagga, Armidale, Bateman’s Bay, Queanbeyan, Port Macquarie and East Maitland. If you would like to host a teleconference site, please contact David Fitzsimons to arrange a site closer to where you live. The final details for the telehealth connections will be distributed to Speech Pathologists prior to the seminar. We have always been very committed to keeping the costs of the VPI Update Seminar each year as low as possible, and this year is certainly no different. We appreciate that professional development for Speech Pathologists can be, and typically is, very expensive, and we have no intention of pricing the seminar out of the reach of Speech Pathologists. The registration fee for the entire two-day programme is still only $165 (including GST) or $110 (including GST) for those who have attended the seminar in the past. This price has not changed since we started running the seminar in 2005, and with your support, we can continue to keep the seminar as affordable as possible. The registration fee for attendance at Westmead or at any one of the videoconference sites is the same. If you need any financial assistance to attend the seminar, please contact David Fitzsimons. Registration for VPI Update Seminar VIII is now open, and can be completed here on the Sticky Tickets website. We would encourage all Speech Pathologists who are interested in attending, to register as soon as possible, and also take the time to read the “Additional Information” and “Frequently Asked Questions (FAQ)” section of this brochure. If you have not attended a VPI Update Seminar previously, please feel free to talk to someone who has, and they will surely let you know that it is designed to be a practical, interactive and fun educational experience. Please complete your registration form as soon as possible to reserve your place and we look forward to seeing you either in Sydney at Westmead or one of our video conference sites for VPI Update Seminar VIII.